Went casting for haruan this afternoon with Jepp at his favourite spot in mile 12 from 2.30pm to 5.45pm. 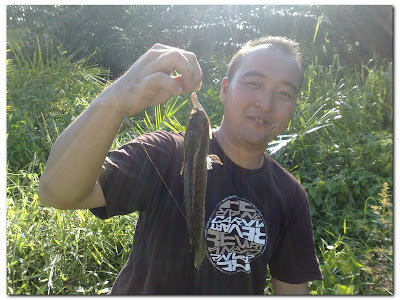 There were a lot of strike but I only managed to land this small haruan using my Berkley's realistic gulp. It was not a good day for us as the weather was hot and we were only able to land a haruan each. My first catch using Berkley's SP. At 8.40pm I went fishing again with Donny in town area. We used prawn as bait. With the setup I used to use in Pulau Bai, I successfully land 2 Oteks and an Agohot. Unluckily for Donny as he was not able to catch anything. All the fish caught today we released back. After few months of not fishing in Pulau Bai, I went there again today ( July 12, 2009 ) with Elysius and the group I used to follow. We fished from 7.30am to 5.00pm. I used tamban, basung and prawn as baits. 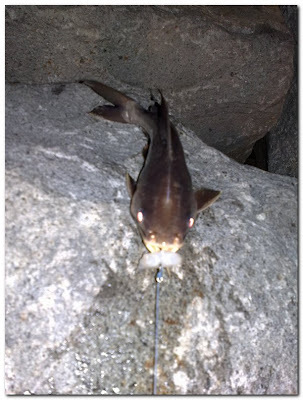 The current was so strong that even my sinker weighing 300g was not able to reach the bottom of the sea. Me, still enjoy fishing in Pulau Bai. Elysius, equipped with apollo with 6 hooks. I took only 2 groupers and 2 gelama. The rest, I gave to Elysius. 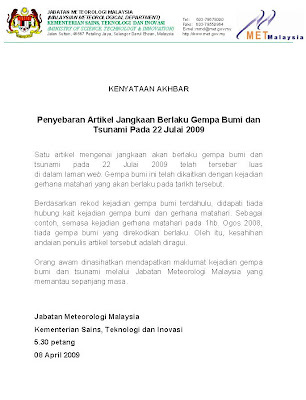 Found this in kakipancing.net. Thought of sharing it with you all. After a week of hard work by our organizer ( Jepp ) to organize this trip, finally, we went to Bakungan last Sunday July 5th, 2009. We were supposed to go to Kretam but the boatman stopped his 200hp speedboat at Bakungan area. He was quite a lazy boatman and he didn't have good 'point' in his GPS system. No wonder why people were laughing at us when we told them that we were following him. Anyway, it was a good trip and quite successful. Bob and Jepp managed to test their new reel and rod. Both of them fought with giant stingrays for nearly half an hour ( refer to http://donnysdk.blogspot.com/ ) and unluckily, the stingrays managed to escape. 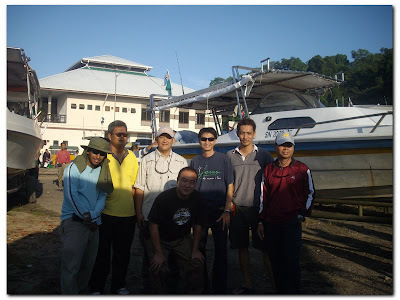 If I'm not mistaken, we have the most catch that day compared to the other boats going to Kretam and Taganak. This trip cost RM1000. Group photo before the trip. From left : Zizu, Bob, Jepp, myself, Donny, Jason and Bakry. The 200hp speedboat we were following. Jepp, discussing with the boatman. Zizu, it has been so long since his last trip. Donny, Jepp, Bakry, Bob and I. The hardworking and kind 'anchorman'. Zizu and my weapon for that day. Daiwa Freams J, Ryobi Metaroyal Safari and Ryobi AP Power. The boatman, Mr Alex Wong. Jason posing happily with his first MJ. Our catch, fishing from morning to afternoon. We only managed to get these fish from this trip. Proudly present the organizer of this trip, Jepp. Overall, everyone was satisfied. We'll have another trip to Kretam at the end of this month. I hope all of us will be able to go out fishing together again. I believed my friends are making a report about this trip in their blog. Feel free to browse them in my Favourite Links ( Donny's and Jepp's Blog ).